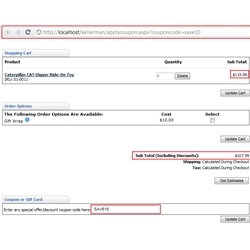 Apply a coupon to the customer's cart with a URL query string parameter. With this add-on, you can link a user to your website and automatically apply a coupon to their shopping cart. This is useful when linking a customer to your website for promotions on your social media networks and retail coupon sites. You can also have a product automatically added to the shopping cart. Apply coupon to customer's cart with URL query string parameter. Able to add product to the cart and apply coupon. Great add-on for social media and email promotions! Takes 30 seconds to install. Works whether the customer is logged in or out. A link on Twitter, Facebook or in an email can automatically give a discount or add an item to the potential customer's cart. Great for Facebook "become a fan and get $10" or "thanks for registering - here's $10" type of discounts.